You've seen 'distracted boyfriend' around. Here's what people are attributing to his whistle. 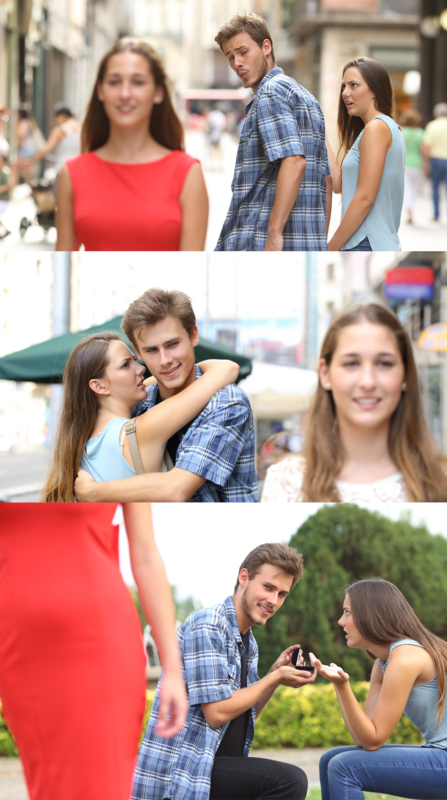 Some call him “distracted boyfriend,” and others just describe the stock photo he’s in as carefully as they can. He’s “man looking at other woman” or, as Shutterstock puts it, he’s “disloyal man walking with his girlfriend and looking amazed at another seductive girl.” No matter what you call him, this guy’s goateed, whistling face has been all over the internet this week, and he doesn’t just represent a jerk anymore; he’s all of us. 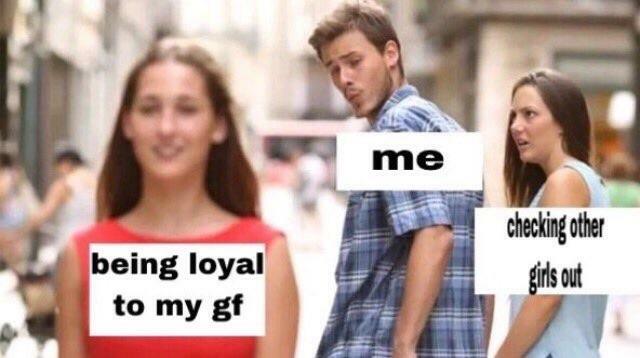 When the meme blew up, people were quick to point out that “disloyal boyfriend” is actually one photo in a series of similar photos. 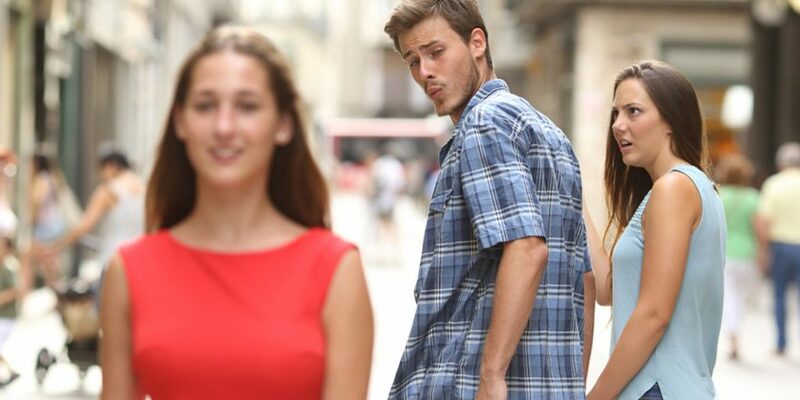 Because we’re looking at stock photos, that means the photographer took several versions of the same narrative — girlfriend catches boyfriend blatantly checking out another woman — in order to give companies options when they select a photo for their article or pamphlet or PowerPoint presentation on infidelity. If we look at the stock photography from an in-universe standpoint, however, this guy is just a ridiculous jerk. In the photos below, he’s checking out the woman in red while proposing to his own girlfriend. Damn, just break up with him already. Relationship-centric memes don’t have a long shelf life; you get the point as soon as they appear in your newsfeed, and then you move on. What gives a cultural meme staying power is its ability to apply to other concepts. With that in mind, here are the funniest examples we’ve seen. Sometimes a meme gets so popular that it fuses with other memes, like the Voltron of internet ephemera. And when those memes become insanely popular, Twitter users like @darth and @leyawn release memes that comment on the very process of enjoying memes, which is, in itself, what people call the “expanding brain” meme. If you’re lost, you may not have a mind expansive enough to handle the following dank meta memes. Sorry. 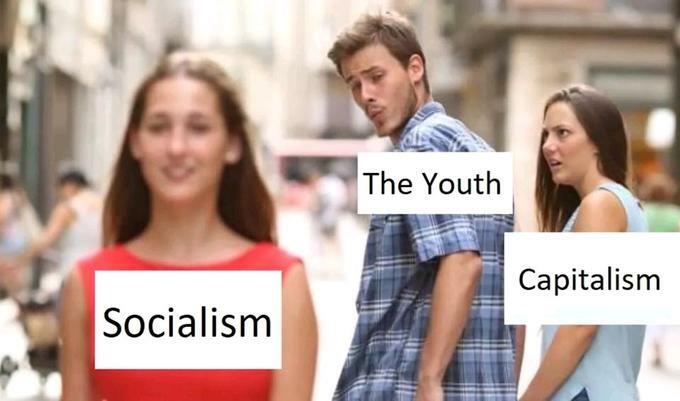 This one is an example of a "wholesome meme," which doesn't make you feel bad about yourself and values empathy over irony. And finally, here’s your reminder to stop looking at memes and get back to whatever you need to accomplish today.